It's time to learn how to play with arpeggio picking - which I like to call "the #1 way to beautify ANY song". 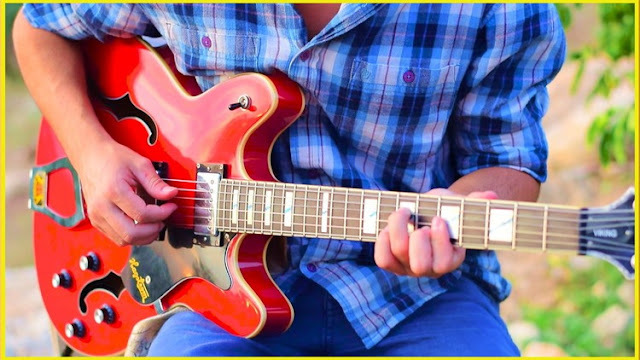 After this course, you will be able to EASILY play any song that you love while using this special guitar technique. This picking style - called arpeggio picking - where we pick the notes individually instead of strumming all strings together - is exactly the topic of the course. This is personally my favorite way to play songs in - and I also really like to take songs that are originally strummed and instead spice them up using arpeggios. All about playing songs using the arpeggio picking - and that means that we will be talking practically and using examples from popular rock and pop songs. Exactly how to transition ANY regular (strummed) song into an interesting, arpeggiated one. The #1 secret for smoothness and accuracy when playing arpeggios - when a friend told me that - my whole approach to arpeggios became a lot more natural and easy, AND I sounded way better. When and in what parts of the songs it'll usually sound better if you'll use arpeggios instead of regular strums. You'll be able to write songs using the arpeggio technique - songs that'll be a lot more unique. Learn the exact arpeggio patterns for songs ranging from Bob Dylan, Jeff Buckley, R.E.M and many other greats. I will teach you a technique that I call the "Arpeggio Bass Stairways" - where you can add gorgeous, interesting transitions between the different chords of the song. How to make your arpeggios "dirty", so you can add some power to the more intense parts of the song while still not playing the simple "down-down-up" kind of rhythm. Guitar players who want to learn one of the best techniques to spice up your song-playing and make it more interesting. Guitar players who feel that they're stuck in a rut and want to add more personal style to their playing.